Engage with a fascinating blend of experiences while exploring Mykonos island on a bike! Take the time to inhale the freedom offered by a cycling adventure and capture each moment with all your senses sharpened. Offering the option of using our electric bikes as well. Although a country girl at heart (Mykonian blood is running through my veins after all), I was born and raised in Athens. My studies at the faculty of Translation (explaining the fluency in English, French, Spanish and Turkish) led me to the beautiful island of Corfu, before starting working in a software company in Chania. The years spent in Chania gave me the opportunity to further explore not only the natural beauties of Crete, but also my passion for outdoor activities, like mountaineering, caving, canyoning, swimming and of course cycling. As I was trying to discover more adventurous ways of traveling, it was revealed to me that the combination of my bike, my dog and my hammock offered me unlimited freedom and unique experiences. This was the first spoke in setting the wheels of Yummy Pedals in motion, my biking adventures company in Mykonos, my grandfather’s birthplace. I will be delighted to meet you, ride with you and share my enthusiasm, knowledge and love for this blessed island with you. 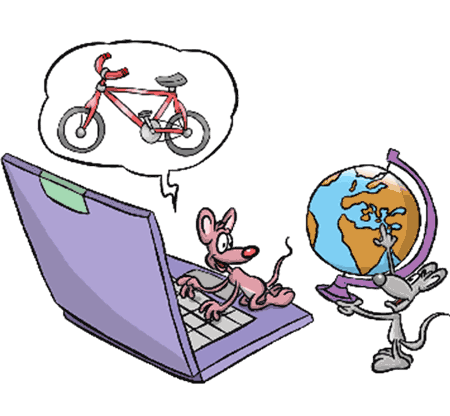 All in your (bike’s) basket! Our top priority, as you uncover Mykonos on wheels, is not only to provide an unforgettable, authentic, cycling experience through off the beaten track routes, but also to guarantee a safe adventure. At our guided bike tours we provide insurance coverage, first aid, technical assistance, thoroughly maintained bicycles and a selection of trails under the criteria of safety. During all cycling tours we guide you through the least used back roads to refreshingly pristine beaches, we provide an insight into our cultural and religious heritage, we offer homemade treats and make sure you leave the beach with the best souvenir, some really unique underwater photos. Guided bicycle tours for families, hen/bachelor parties, cruise ship passengers (looking for a half day tour), newbies or just cyclists who want to take it easy on their vacations in Mykonos. Especially if you are looking for activities for kids and teens during your holiday, these tours are just right for you. The focus is on a fun, stress-free, leisurely-paced experience for all. A child-friendly, manageable by any rider, bicycle tour that will take you through predominantly flat countryside, with occasionally only hilly terrains, to the spectacular beach of Fokos. Half part of the trail is on earth road, but it doesn’t present any danger or difficulty. Addressed to local and non-touristic experience hunters. 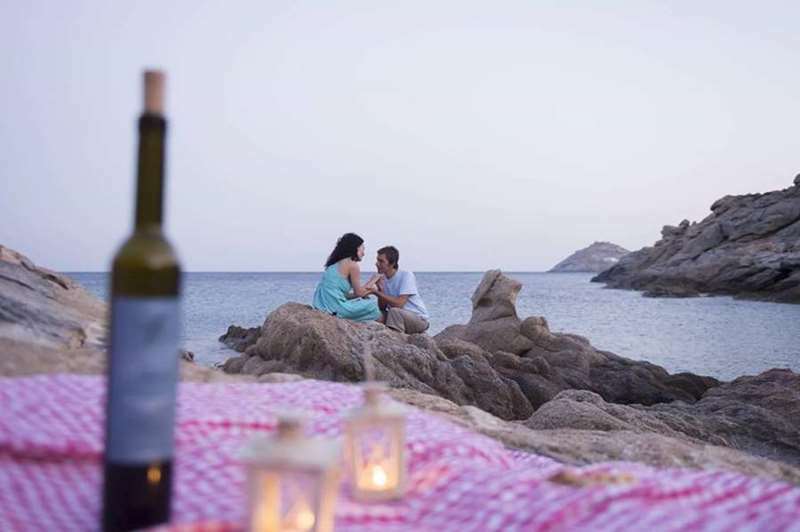 Explore not only the natural beauties of Mykonos, but, additionally, its rich culinary and wine tradition first hand. An easy- to- manage itinerary allowing you to take your whole family or invite even your non-cycling friends along. Our most popular biking tour, with only occasional hills and half of the route winding through the reservoir of Ano Mera on earth terrain. For couples, honeymooners, birthday and anniversary celebrators or just groups of friends who never cease to be romantic souls. A private bike tour to a secluded beach, where you will enjoy full privacy allowing you to express all your intimacy and love. Submerge into your most romantic mood, while enjoying the sheer magnificence of the landscape, sipping your local wine at dusk and covering your partner in tenderness. An easy cycling trail with hilly parts, the length and inclination of which depends on the selected destination. These biking tours will intrigue your sense of wonder and adventure, providing a deeper insight into Mykonos’ cultural and natural heritage, while challenging you physically at the same time. Whether an alternative activities lover, a tradition explorer, an azure waters hunter or simply an active adventures seeker you will find your ideal cycling tour here. 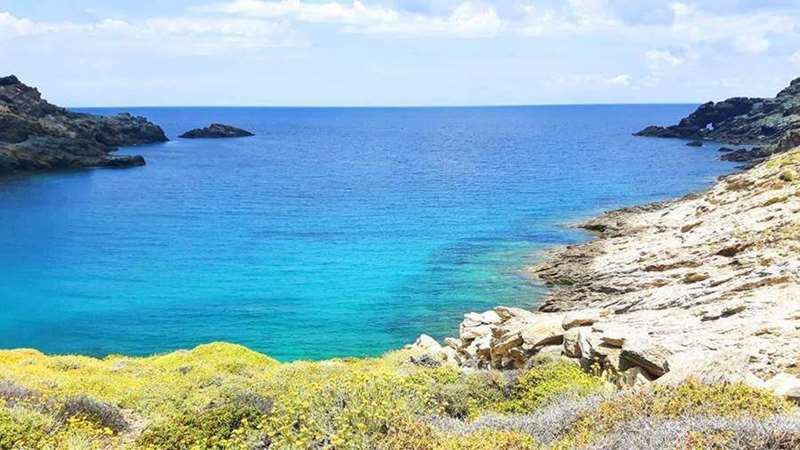 If you do not get intimidated by steep inclines and you want to discover the natural beauties of Mykonos and its coastline’s turquoise-blue waters, this tour will give you access to two beautiful beaches of the island. A tour to Ano Mera village with its monastery and Fokos beach. An excellent introduction to the very distinct characters of Mykonos Island, featuring a fascinating mixture between our religious tradition, easy off-roading, a pristine beach and the rural & wild landscapes of Mykonos . For a short part of the trail we ride through busy (during the peak season) roads so this tour requires some familiarization with riding on main roads. A full day cycling tour to a “private” cove, Ano Mera village with its monastery & Fokos beach. For those who feel like discovering the real Mykonos and do not fear biking on main roads. An insightful but long tour into Mykonos’ traditions, natural beauties and amazing beaches. We traverse the central part of the island from its southern part to the northern beach of Fokos, passing through the village, the reservoir and the rural landscapes of Ano Mera. Tours addressed ideally to MTB junkies, but also those who get intrigued by the wildernesses of Mykonos Island and its off the beaten track hidden natural beauties. If you are looking for real adventure activities, these tours are tailor made for you. A physically challenging tour, as we cycle up the mountain (on paved route) in order to reach the wind turbine, from where we can enjoy the most amazing view over the northern coastal line. For those who can handle the extreme, but thankfully short, subsequent inclines, this is one of the most scenic rides. For private and fully customizable tours, prices substantially vary. In this case, please fill in the contact form further down. offering you the chance to unwind with a wine tasting experience. Are you a travel and/or food v-/blogger? There are special deals for travel bloggers, so if you are interested in promoting Yummy Pedals and/or Mykonos Vioma, please let me know. 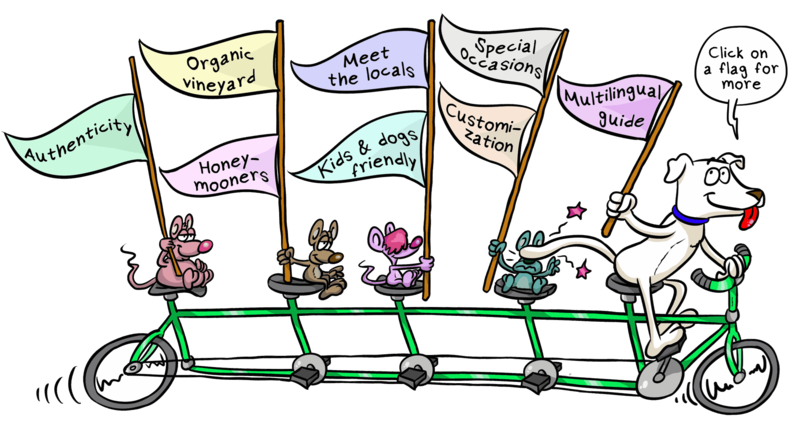 Yummy Pedals is located at the Organic Farm & Vineyard “Mykonos Vioma” at the region of Maou, Ano Mera. While driving along the central road leading to Ano Mera (coming from Mykonos town), still on the main road, you will find on your right hand Koutsothanasis bakery at the outskirts of Ano Mera village. Across the bakery you will see a war heroes’ monument and the 1st sign towards Fokos beach. Turn there, following the sign towards the beach of Fokos and taking the road behind the monument. At the 2nd sign, continue left towards the direction of Fokos beach once more. At the 3rd sign, at the intersection of Maou-Doubakia-Fokos, turn right towards MAOY and follow the road ahead. 200m after crossing the bridge, you will meet the grey metal gate of the vineyard on your left hand. 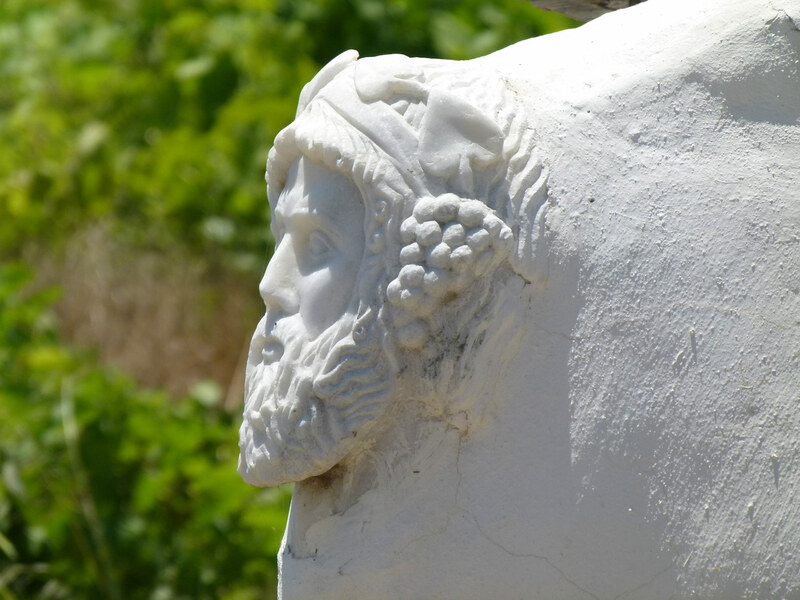 Explore Mykonos’ wine & culinary tradition at the historic vineyard of Mykonos Vioma. Escape the stereotypes of Mykonos buzz by visiting Vioma, an organic vineyard and charming little farm, untouched by modern and touristy influences, where the vines grow with classical music. Come and discover more at the monastery vineyard of Maou, where you can live an authentic and unique wine tasting and farm-to-table experience after your biking tour - or independently. This bike tour was just what I had hoped for... A bit of fun, relaxation, swimming, and delicious bites.... And almost forgot... Wine tasting!!!! Dimitra is awesome. Would go back in a heartbeat. We are a family of 5 and had a half day into the evening on Mykonos as a shore excursion during our Mediterranean cruise. I wasn't up for the Paradise Beach scene and wanted to see more of the island. Dimitra our guide and the owner of Yummy Pedals was FABULOUS!!! I can't say enough good things. She speaks excellent English and was easy to work with ahead of time planning our day. She picked us up at the dock and even organized last minute some changes to the schedule. We went to her families restaurant and vineyard where we picked out our bikes. From there we headed to a few different beaches based on the weather and time of day. She did a great job explaining the island, local customs and sharing some homemade treats with us. We swam in the sea and rode back to her place. From there she drove us into town encouraging us to venture out on our own exploring this charming village. It was a remarkable day and if you don't mind getting some exercise this is a GREAT DAY. I was wavering between the kayaking or scuba diving but be couldn't be happier that I went with the bike riding. My teen boys and hubby loved the day! This will not disappoint you and can be geared to adjust all levels of riders. Excellent "taste" of the other Mykonos! First I was reluctant to join in a tour, as I don't count myself among those fit and trained bicycle lovers. Then, I found out that I could choose among different tours of different difficulty and I was glad that I had this great experience with yummy pedals! The whole experience was much more than cycling. It was rather a great chance to come together with a local, eager to share her enthousiasm about the other side and the beauties of the island like picturesque hidden paths and crystalclear hidden waters. Although the owner and tour guide was a real professional, she was very friendly and made us feel like part of the Mykonian people family. Her fresh made limonade and cake were served at the right time and were delicious. We had a wonderful time. You really see what the Greeks are all about on this trip. Friendly, genuine and focused on your enjoyment and comfort. The bikes are in great shape and the trip was just right for our large and varying group. The secluded beach was exactly what we wanted away from all the hustle. They even dropped some of us in town while took the rest to the cruise terminal. The muffins and the lemonade were perfect for our one big hill climb on the way back. The non fussy and completely friendly staff was perfect for our group. All this and we supported a great woman who genuinely took the lemons the Greece crisis provided her and turned it into lemonade. Kudos. The bike tour that Dimitra led went beyond my expectations. We went for the relatively easy bike tour with a picnic at a beach and were pleasantly surprised at every turn. She took time to explain various details about the history of Mykonos and prepared a delicious meal for the beach. The bikes she has are also very high quality and a pleasure to ride. I would absolutely recommend taking a bike tour with Yummy Pedals and wouldn't hesitate taking another if I'm ever back in Mykonos. Wanted to do a little active excursion ater relaxing on the beach for days. The tour covered hills, valleys, a secluded beach, and a monastery all in under 3 hrs. Our tour guide Dmitra was wonderful, warm, and informative and they did a great job for others on the tour that had limited experience with biking. Equipment was very well maintained and they provide all of the gear you need. Her super friendly dog also joined us or the ride and carved out a place as the center of attention! Highly recommended for an adventurous detour! This tour is a great getaway from crowdy, touristy Mykonos Town to see the beautiful Mykonos Island. Dimitra was knowledgeable and hospitable to our group and responsive to our needs. Be sure to stay at the winery after for lunch to taste more fresh and local food. Something different on Mykonos island! This was one of my favorite activities while we visited Mykonos. Dimitra showed us a side of the island that most people don't get to see AND we got in a great workout. But the real treat was swimming at the "secret" beach (or maybe it was the yummy homemade lemonade). She even offered to take underwater photos of me and my boyfriend, which I thought was pretty cool. Dimitra was especially patient whenever my boyfriend wanted to stop and take photos with his own camera (which was pretty often). Although I'm active, I don't ride a bicycle, so I found our ride to be challenging, in a good way! We really enjoyed this tour and would recommend it to anyone looking for something different to do. We decided to book a yummy pedals tour 30 minutes before it departed and we were on the other side of the island. Dimi was so wonderful and waited for us to arrive at the beautiful farm. Once there, she made us feel so comfortable and welcomed (and she even let us borrow shoes because we forgot ours)! The day was one of the best days we've had. We saw parts of the island that we wouldn't have seen and swam in the most amazing crystal blue water at our own secluded beach. Dimi even bought her underwater camera for us to take photos on. After our swim, Dimi and her assistant made us the tastiest lemonade and provided us with yummy muffins whilst we sunbaked on the beach. The cycling was so much fun and defiently gave us a great workout. We would recommend this tour to everyone! A perfect day! Thanks Dimi. There are plenty of sites on Mykonos full of tourists, but Dimitra and Yummy Pedals was a real step away from all the crowds. Beautiful countryside views during our bike ride were punctuated with a swim on a very private beach and a visit to a very soulful Monastery. Then, the home grown, lovingly prepared food and the wine from her family's organic farm / vineyard was just divine. I would highly recommend this outing before going off to explore Little Venice or other sights on Mykonos. Hola all, We had the absolute pleasure spending a half day with Dimitra and her family. We emailed back and forth before leaving home about meeting times (we were on a cruise) and location. Another couple from the cruise was also on our tour so we were picked up together in town and taken out to the farm. There were 6 of us on the morning ride. The ride is pretty easy and you should have no problems with it if you are comfortable on a bicycle (well, maybe a little trouble on the hill from the beach...but you can walk your bike up no problem and spending time on the beach is pure bliss). We were given a cold bottle of water and a quick lesson about the gears and away we went. Along the way to the beach we stopped at a small private church and got a lesson on why so many homes have them. We then stopped at the fresh water lake and dam used for drinking water on the island. Then we headed to a beautiful beach that we almost had to ourselves. If you've been to Mykonos, you will understand how special it is to have a beach to yourself. The water was crystal blue and super refreshing after our bike ride. Dimitar pulled out delicious homemade lemonade and muffins for a snack and offered to refill any empty water bottles with cold water. When we arrived back at the farm we all stayed for lunch (which will be reviewed separately). All I can say is, you want to make sure you stay for lunch and wine. Make sure to book well in advance, this little tour is growing greatly in popularity. We've joked that we will return next year to work for Dimitra she will have so much business.